Two St. Louisans want to stop the loan of George Caleb Bingham’s painting “Verdict of the People” for Donald Trump’s inaugural luncheon. 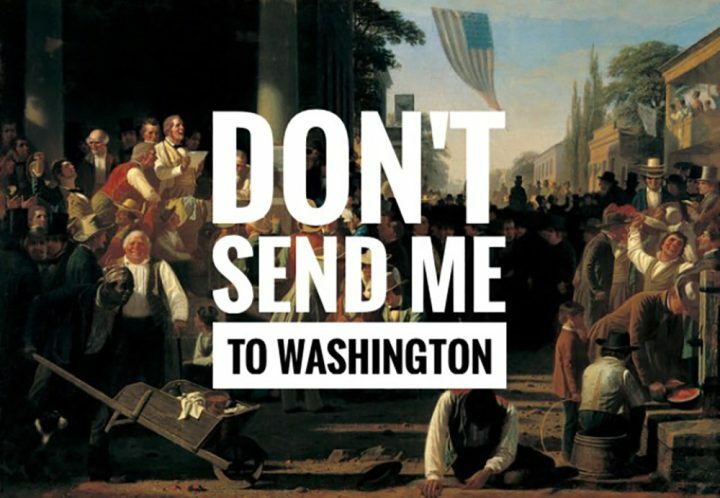 Two St. Louis-area residents have launched a petition demanding that the Saint Louis Art Museum’s cancel its loan of the George Caleb Bingham painting “Verdict of the People” (1854–55) for Donald Trump’s Inaugural Luncheon in Washington, DC later this month. The petition, created by art historian Ivy Cooper of Southern Illinois University Edwardsville and St. Louis artist Ilene Berman, has already gone past its original goal of 1,500 signatures and is approaching its new target of 2,500 signatures. At a small luncheon honoring Trump and involving congressional leaders in the Capitol’s National Statuary Hall afterward, a painting by 19th-century Missouri artist George Caleb Bingham will be featured. “Verdict of the People,” is the third of Bingham’s trilogy on American politics and elections, a complicated work symbolizing the strife and rough politics of an era of even greater political and social turmoil than the current one. Bingham’s 1855 painting depicts the announcement of election results from a county courthouse, and together with two other paintings — “Stump Speaking” (1853–54) and “The County Election” (1852) — it forms a trilogy of works commenting on US democracy. But what many people may not know is that Bingham was elected to the Missouri House of Representatives in 1848, one of the first professional artists to ever win elected office in the United States. This insight gives the painting particular bite, and you can sense his personal knowledge of the subject. The election Bingham depicts in the trilogy takes place in Saline County, Missouri, where the artist himself was running for a seat in the State Legislature in 1850 and lost. The artist inserts his opponent, Erasmus D. Sappington, as the suspicious candidate in the shiny top hat in “County Election.” The artistic editorializing doesn’t stop there; Bingham’s opponent allegedly tried to buy votes with liquor, which is also hinted at in that painting. Further casting doubt on Sappington’s victory is the fact that he was related to the judge and one of the clerks in Saline County, which aroused suspicion, even if it didn’t change the results. The artist/candidate doesn’t appear to have publicly contested the results, though they clearly had an impact on these paintings. Knowing the context of the works, it’s clear that the artist was well acquainted with democracy’s flaws. The museum takes no position on candidates for public office, nor does it support or oppose individuals elected to such offices. It does, however, support the office of the presidency itself. When the bipartisan Joint Congressional Commission on Inaugural Ceremonies requested the loan of a painting for the Inaugural Luncheon, it was an honor for the museum to participate in this long-standing tradition. We are not surprised by the Museum’s response, but take issue with two of its specific claims. First, we feel that the museum falsely assumes that this electoral process was within the bounds of normalcy. We, and the signatories of the petition, do not agree and because of that think the customary responses to requests of this sort need to be made with more care and more concern for the Museum’s community. Second, lending this artwork for this specific inauguration is not an ‘honor’ because it normalizes the hatred, sexual abuse, and disregard for the office expressed by the president elect. We, too, ‘support the presidency’ and believe the withholding of this specific artwork on this occasion would be a strong expression of our community’s respect for the office of the President. Having just heard from Director Brent Benjamin, we intend to take him up on his offer of an in-person conversation to discuss this further.